Kayaking is a sport that is easy to fall in love with. A great upper body workout combined with the joy of being able to escape into the open water is incredibly appealing. Using your recreational kayak for leisure can be incredibly rewarding and take you to places you have never been before. Kayaking allows you to go on day trips through still lakes but can also take you through rough waves on the ocean. Some kayaks even have capabilities to take you down intimidating river rapids. These little boats offer up endless opportunity. The best recreational kayak will be one that allows you to use it in multiple different ways. All around great boats will have features that allow you to take them through rough rivers and still lakes. We have found the top five recreational kayaks on the market that do just that. 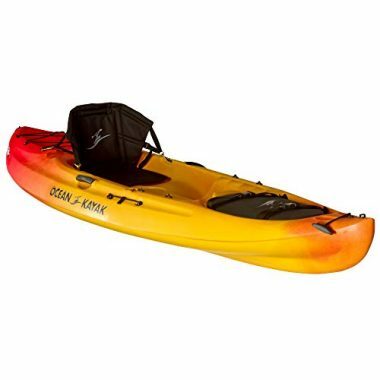 This is a great option for beginners looking for an easy to transport and compact kayak. 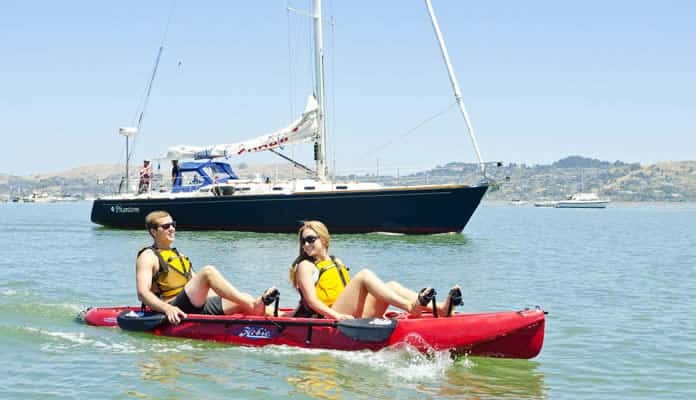 This tandem recreational kayak carries a spacious design with lots of room for movement. 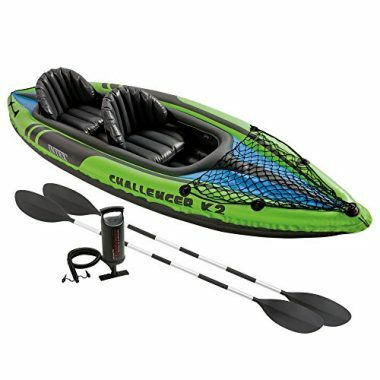 Coming equipped with two paddles and an air pump, this set has everything you need to get on your way. With a heavy duty puncture resistant vinyl it is even tough enough to bring your pup along for the ride. The double sided grab lines make docking and transporting this kayak a breeze which can relieve nerves of novice paddlers. A front spacious cargo net will allow you to pack gear with you in an easy to reach convenient location. Simply grab some dry bags for your luggage and stow them close to you. An inflatable backrest provides a comfortable seat that molds to your body providing even more support and cushion. This is the best recreational tandem kayak that is inflatable and is able to brave the surf navigating you down rivers and across still lakes. This Advanced Elements AE1012-R kayak is the best recreational lightweight kayak for getting to this places where other kayaks cannot. When you buy this kayak, all you have to do is unfold it, inflate it, and attach the seat. This means that you can get this kayak into waters that you cannot with other kayaks. 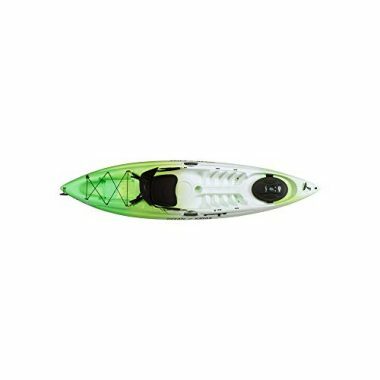 The portability is a big selling feature of this kayak. The fact that it is inflatable also means that you have less of a problem transporting it, and you can take it in your car without having to buy a rack for the top of your car. 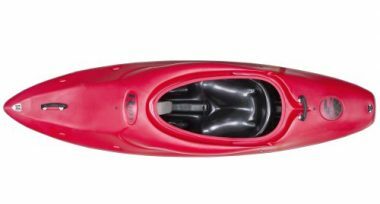 Do not let the portability fool you, though, as this kayak handles and paddles as well a rigid kayak. You also have multiple air chambers, so if you do get a puncture, the kayak will not go down. This is the best recreational sit in kayak built around comfort. There is a sit-in cockpit which is the height of luxury. Form the moment you sit inside of it, you will feel as if it is molded to fit your body. The cockpit is large and well-built. The seat is padded and comfortable to sit on. If you do not find it comfortable at first, then it is fully adjustable so that you can find the position you need. The leg braces are also fully adjustable to give you the perfect fit. When you are in the water, the spray-deflector collar will also stop the water hitting you and getting inside of the kayak. The Sun Dolphin Aruba 10 kayak also features bungee rigging for your cargo so you can take your lunch with you on your trip out on the water. This is a recreational kayak designed to give you a smooth ride through those mountain lakes. The Ocean Kayak Scrambler 11 can be used for a number of different activities. The thoughtful design allows the hull to respond well in rough ocean surf conditions while the sleek design helps it to track well in calm flat water. Pack your fishing gear for a day on the lake knowing you have a paddle holder on board to free your hands. 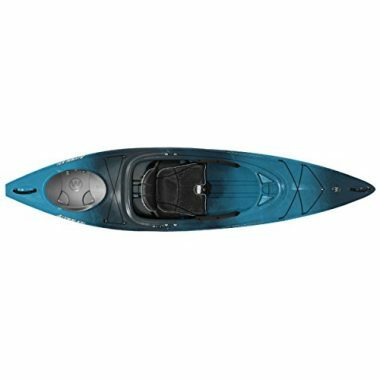 A great all around kayak, it features a double foam padded seat back which provides additional comfort making it a great choice for fishing or longer paddles. The sit on top design along with the overlapping foot wells allows you to ride in comfort no matter your size. With a fully replaceable rear skid plate you no longer have to baby your boat knowing that it can take a healthy beating and easily be replaced. This extends the life of your boat tremendously. Storage is no problem in this kayak, with front and back deep wells with bungee straps simply toss your gear in dry bags and pack it aboard. It even has an additional locked hatch that provides additional dry storage. With a molded in side handle for easy transportation and an easy to access cup holder this kayak becomes even more user friendly. Allow this kayak to take you anywhere you want to go for your next adventure. This is the best recreational sit on top kayak that boasts a sporty sit on top look. Great for paddlers of all sizes the Ocean Kayak Scrambler 11 boasts a spacious design with overlapping foot wells to give you the leg space you need. A durable foam padded comfort seat back is 4-way adjustable which provides cushioning and support for long paddles. Tracking smoothly through flat water this kayak is great for long paddles and fishing. The hull shape even allows this kayak to respond well in surf making it an all around good choice. This boat has lots of on deck storage including front and rear deep channels with bungee systems. A 6 inch Cam Lock Hatch even provides dry storage for things like phones or cameras. Never be far from your drink with the on board molded in cup holder. A paddle holder allows your hands to be free for a mid lake lunch or for a day fishing. Maximizing performance this boat will take you where you need to go in style. This is the best recreational beginner kayak which has been designed for comfort as well as performance. The cockpit is roomy enough for you to stretch out and relax while you are paddling amongst the mountains but still gives enough performance to navigate faster water when you get to it. The short length of the kayak makes it great for turning quickly and navigating twisty waterways. This kayak is lightweight, making it great for transporting to the water and also ideal for moving between bodies of water. This makes it a great kayak for an adventure. You can go out all day in this kayak and not feel as if you have been sitting in a kayak for hours on end. 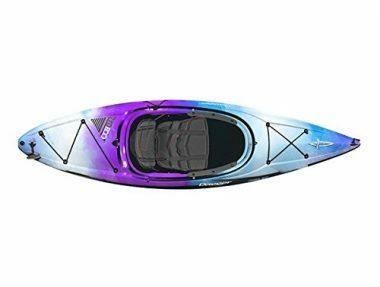 This is the best recreational kayak under 500 that is sporty and which will be great for navigating down the fastest waters with a friend in tow. The kayak is large enough for two people to ride, but they will be riding in comfort. The kayak is spacious enough and built to hold two large people. The seats feature soft backrests for added comfort, and there are also two sporty paddles included, allowing the two of you to paddle quickly through the rapids. This is a ‘high and dry’ hull to keep you out of the water. This is the best kayak for recreational use on our list for two-person stability. It is almost impossible to tip this kayak over when you are in the water, and that stability does not come at a cost. This kayak will still track well and give great performance in slow and fast-moving waters. This is a great kayak for beginners. It offers a good compromise between affordability, comfort, and performance. 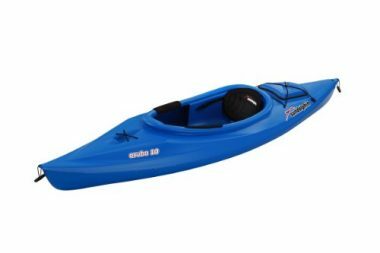 If you are just starting out with kayaking, then this is a great kayak to get you started. 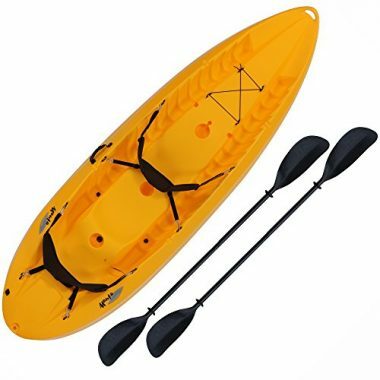 The carrying handles make it easy to move this kayak about when you are out of the water, and the shape of the kayak makes it easy to maneuver when you are in the water. The seat is comfortable with extra padding for long trips. There are also adjustable foot braces and thigh pads for enhanced control. The stern hatch provides you with the room you need to store any of your additional equipment and food. This is the best recreational kayak that is multi functional performing at the top of its class in both comfort and design. Cockpit seating is designed for maximum comfort with a spacious feel. A user friendly quick and easy SlideLock foot brace helps adjust for your height. An ultra comfortable seat provides back stability for longer more comfortable paddles which extend to the bottom of the boat lifting your legs which combats leg fatigue. A thick plastic outer shell made from polyethylene is incredibly forgiving for paddlers who encounter an unexpected rock. The slightly arched hull allows even novice paddlers to be able to maneuver as though they were an expert. A skid plate helps to ensure that this boat remains durable and stays with you for longer while the low profile design will provide stability and control in the surf. Great for still lakes, this kayak can even perform in rougher water with a drop skeg that provides better tracking. There is no shortage of storage on board this kayak. A bungee deck storage as well as a rear covered storage nook ensures you will be able to pack all you need for even extended journeys. This kayak is even equipped with a water bottle holder ensuring you have everything you need within arms reach. If you are looking for a maximum performance kayak for the ocean or white water surfing, look no further. This impressive kayak has a unique shape which helps propel it through the water with speed. Sharp rails and a flat back combined with a spacious front end allows the kayak to bring all of your gear with you no matter the water conditions. The comfortable power seat provides a wide range of motion which helps you stay in control. With a drain plug built in, getting wet while navigating your way down a choppy river bed is no longer a concern. A gracious cockpit and easy to shape foam foot blocks allow this recreational kayak to be loved by any size paddler. Carrying this boat becomes easy with its two rubber grab loops for easy transportation. This is a well equipped best recreational kayak. We have created a recreational kayak buying guide that will help you to determine key features in your next kayak. Being prepared for your day includes being able to bring all of your luggage and gear with you. When using the top rated kayaks recreationally, getting a kayak with top of the line features will ensure a perfect day on the water. They are famous for their stability and maneuverability making them the best boats to use if you are looking for a fun day on the water or are new to the sport. Their unmatched stability will quickly instill confidence in your rig and make you never want to get out of the water. Having a skid to line the bottom of your boat will give your kayak added durability. This will act as a barrier between the bottom of your boat and some unexpected rocky terrain. Great for beginners or those going in unconquered areas that may have some unexpected surprises a skid plate will ensure you stay afloat. 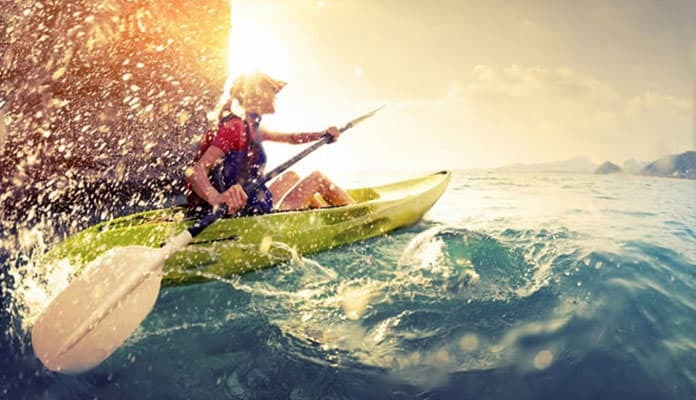 Some kayaks even have a replaceable skid which means that once it sees some wear and tear you can simply replace the skid rather than buy an entirely new kayak. A skeg is essentially a fin that is often retractable on the bottom of your kayak. This is important when navigating through rough water. A skeg can be lowered into water when in turbulent water to allow you to formulate a straight path in the water. This is a great feature when looking to do distance paddles. A recreational cockpit should be large enough for you to get in and out without bumping your knees or body. It will be a long oval shape that makes you feel comfortable. You should be able to put a blanket around you for the colder days and have enough room to move your feet around. Your legs should be able to stretch out and have wiggle room. Keep in mind that if you do roll your rig you should be able to quickly escape if emergency maneuvers fail. This is an important factor when considering a rec kayak. A comfortable seat will make your trip more enjoyable and comfortable. Look for a fully adjustable seat with lots of padding. You can add a pillow or even a yoga mat for added comfort, but having a base that makes you feel comfortable and confident is vastly important. The whole idea behind the best recreational kayak is to be able to take the sport with you wherever you go. To be able to get the most use out of it, we recommend getting a lightweight boat with carrying handles that allow easy transportation. Portaging your boat between lakes or even just transporting between your car and the river will be made easier with a lightweight and easy to carry design. You get what you pay for with the best recreational kayak. A lightweight, comfortable rig can range from $500 to $1500. When looking for a boat for you there are many things you should consider that will affect the price. Weight is a key factor. The lighter the kayak is the more money it will cost. The trick here is to get a boat that you feel comfortable handling. If you can’t lift the boat onto your car or trailer chances are you won’t get on the water as much as if you like. There are a few different styles of kayaks you can choose from. Each one has their benefits and drawbacks. Understanding these will allow you to make a decision that will be best for you use. This is where the deck of the kayak is open and flat. It allows you to go for a swim in the middle of the lake. These rigs are great for days on the lake but can’t stand up to the massive waves found in the ocean. These are enclosed kayaks that you sit inside. They are what most people think of when someone says “kayak”. Their shape allows them to cut through the water while keeping you warm. This makes them a great option for early or late season trips. These kayaks can also be used in white water and river situations where other types, like a sit on top, are not ideal. An inflatable sit on top kayak gives you the benefits of a rigid model, with added portability. These don’t take that long to inflate and can be just as durable as their more traditional counterparts. Even if you live in a small apartment and only have a car you are still able to easily transport your kayak without special straps or a rack system. You can even take your inflatable kayak on hikes and use it when you get to your perfectly secluded lake. Q: How Long Are Recreational Kayaks? A longer rig will be more stable in the water while a shorter one may be more maneuverable. 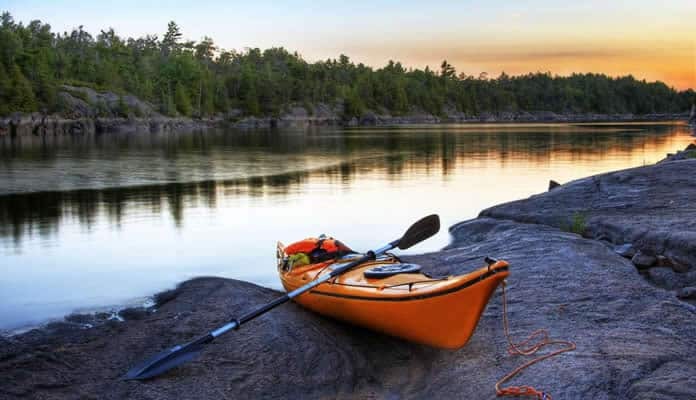 If you are planning a camping weekend on a relatively calm lake ahaving the best recreational kayak will be able to get you to your site without issue. With that being said, these aren’t usually the type of kayaks you would take on the ocean or on a long haul trip. They are more for cruising around the lake with the family. Q: How Much Does A Recreational Kayak Weigh? A: Recreational kayaks can weigh anywhere between 20 and 100 lbs. The large variation comes from the type of materials that are used. If you have a polyethylene (plastic) boat it will be the least expensive but also one of the heaviest. Fiberglass is a great compromise between weight and price while composite kayaks will be the lightest but also the most expensive. 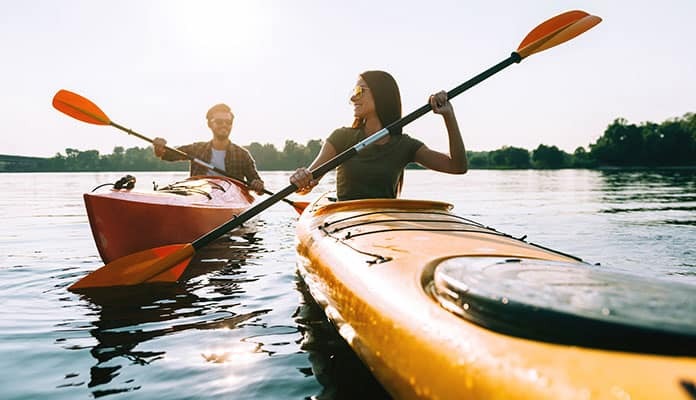 Pro Tip: If you are looking for a beginner recreational kayak you may want to start with a polyethylene option as it won’t set you back financially while allowing you to see if you enjoy the sport. Q: How Should I Choose A Recreational Kayak? A: When trying to decide which recreational kayak is best for you, it is important to first ask yourself a few questions. First off, it is important to consider how many people will be using your kayak. Will you be needing a solo or tandem kayak? Be sure to consider kayaking with your dog as they will require an extra seat as well. It is also important to determine a budget in the beginning stages of your search. This will help narrow down which kayaks you should be looking at. Finally, consider what you intend to use your kayak for. Do you plan to spend long days stretching out in your kayak fishing? Maybe the Ocean Kayak Scrambler 11 Sit-On-Top Recreational Kyak would be best for you. Or would you rather get an adrenaline rush as you plow through the ocean rapids? Then you may want to consider the Riot Kayaks Boogie 50 Whitewater Surf Kayak. Deciding how you plan to use your kayak will allow you to make an informed decision on which one is right for you. It will also give you an idea of the different priorities you have for your kayak. Are you needing one that can stow lots of gear or one that is compact and easy to maneuver? 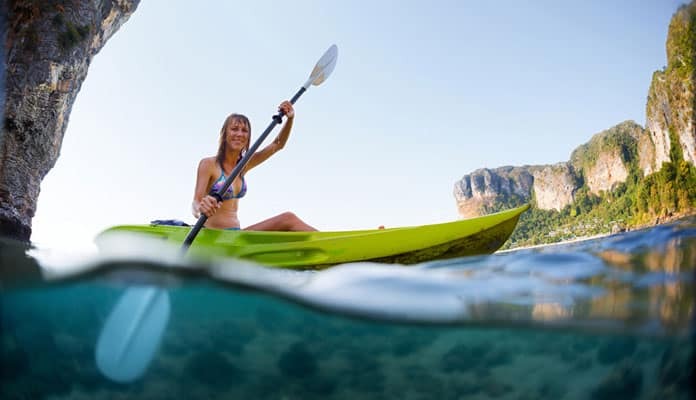 Answering these questions will ensure that you choose the best recreational kayak for you. Q: How Do I Paddle A Recreational Kayak? 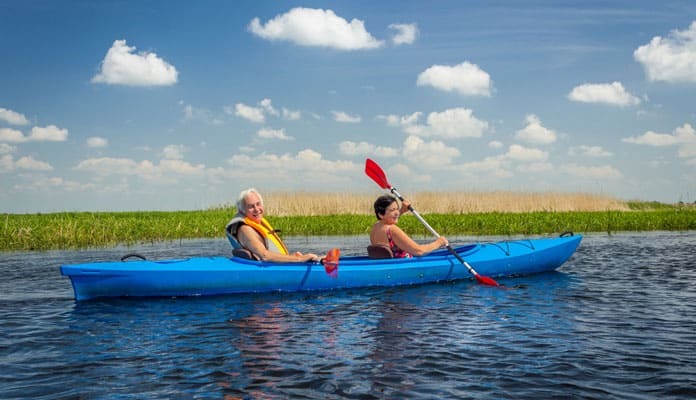 A: There are many different types of best recreational kayaks and each one will have its own ideal way of paddling. For example, a sit on top kayak will require more effort from your core and legs while a traditional setup will produce power predominantly from your arms. No matter what style of kayak you have your legs will be a key aspect. They give you stability and increase your control when paddling especially through rough waters. Q: Why A Recreational Kayak? A: These are kayaks that have added stability for a great overall boat. Instead of a kayak that is only good for one type of environment, like an ocean fishing kayak for example, a recreational kayak does a lot of things well. It has a long enough body that it can handle some wake, but not long enough to take it through rough ocean waves. These kayaks also have a stable base which makes them great for beginners or people who have limited experience in these types of boats. Best recreational kayak reviews agree that having a boat that can seamlessly perform in both still lake and open water conditions is key. One with a comfortable seat that is adjustable to fit your height will allow you the freedom to stay on the water for longer periods of time. Regardless of whether you are buying a kayak for long paddles or just weekend fun, we recommend a kayak that can handle being in surf so that you can safely go into lakes and rivers with unexpected conditions. New to kayaking or have a kayak on our list? Let us know how you like it in the comment section below.